This review first appeared in the April 8, 1994 issue of the North County Blade-Citizen (now North County Times). San Diego's Earl Thomas is poised to join fellow local A.J. Croce in gaining fame and fortune on a national stage. While only time will prove whether Thomas does hit the big time, the fact remains that his second album, "Extra Soul," fulfills the artistic promise of his 1991 debut, "Blues ... Not Blues" with a huge helping of pop accessibility thrown in. Thomas can't really be compared to anyone, because he combines so many influences to achieve his own, unique sound. Listening to "Extra Soul" reveals bits and pieces of everyone from Ike Turner to Rufus Thomas to Muddy Waters to Isaac Hayes. With this album, Thomas has remolded the blues into an accessible, personal sound that is as capable of getting pop airplay as any of the soulless schlock dominating the radio today. 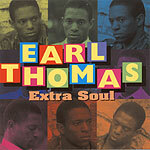 "Extra Soul" finally succeeds because of the songs. This album is full of hook-laden R&B tunes like "Could We Be the Same," ballads like "Nobody" and the rocker "I Am the Cool"  all of which are capable of making the charts. With Thomas performing them, the odds only increase.